The greenhouse was originally erected by Mike and his grandfather in 1963/64 and it was well-used by both his grandfather and his parents and measures 12ft x 8ft. However, when we moved into the house in August 2008 it hadn't been used for a number of years. We would, ideally, liked to have moved it to the back right-hand corner of the garden as there was quite a large area of garden behind the greenhouse. However, in view of the length of time it had been standing we felt it too risky to even attempt to move it. We decided to leave it in situ and came up with the idea of using the area behind for a vegetable and herb garden as this would then be separated from the main garden. Needless to say, for the next four years it wasn't used and simply became a dumping ground! In April 2012 we finally got round to having a grand clearout. It's amazing what we found – particularly in the form of tools which had been purchased by Mike's grandfather. Unfortunately most of them weren't worth salvaging so, reluctantly, we had to throw most of them away. We also got rid of hundreds of plastic plant pots. We even found a wooden dibber (left) which Mike had made at school in the mid-1960s which, of course, we decided to keep! 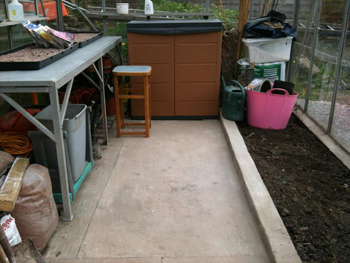 We had originally put a shelving unit at the back of the greenhouse (above right) but everything on it looked untidy so we bought a storage cupboard (right) from B&Q so that everything could be hidden! It also meant that any garden chemicals such as weed killer etc. would be hidden from view – particularly in these days of health of safety. We have an old-fashioned coal shed attached to the house and when this is cleared out we may use that to store all the gardening tools which will give us even more room in the greenhouse. 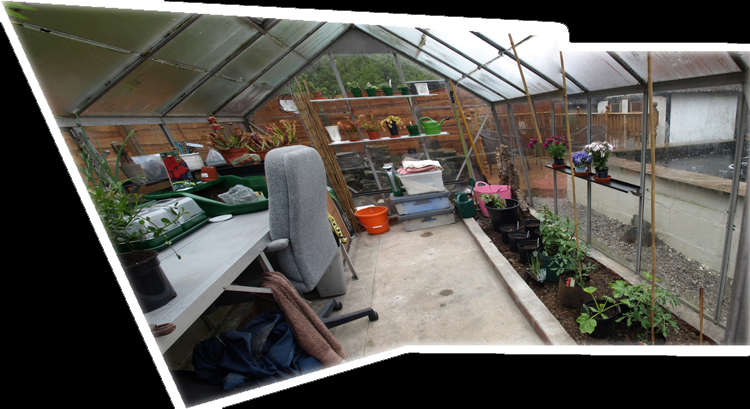 Needless to say, in May 2014, this still hadn't been done – the tools are still in the greenhouse! The latest plan is that they may be put in the shed when, and if, one is erected! That apart, it is now virtually ready to be used for its original purpose - sewing seeds, taking cuttings etc. 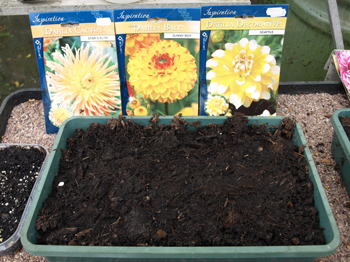 Mike planted our first bulbs (Dahlias) in May 2012 (see left) so, as the old saying goes, "watch this space"! Unfortunately, we're now in August 2012 and there's no sign of activity! Mike has always had a passion for carnivorous plants and, eventually, he would like to turn the bed on the right-hand side of the greenhouse into a carnivorous plant display area. In the meantime he has a selection in pots on the staging which are all doing extremely well (see below left). He has also planted a couple of tomato plants and a green pepper plant which, again, are doing well. 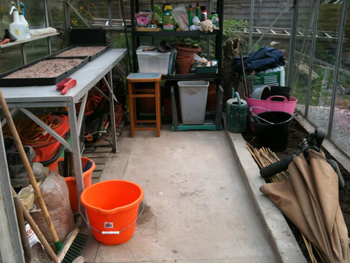 Although we had had a major clearout of the greenhouse in April 2012, we still weren't using it properly as working greenhouse, so, in April 2013, we had another clearout and moved things around to make the best used of space. We also painted the existing four shelves with a suitable black paint for steel, so that we could actually start using them, plus, we bought an additional couple of shelves. We purchased pots, saucers, seed trays, propagators, labels etc so that we could start to grow seeds,plant tubors and vegetables have a go and cuttings. We even put a nice comfortable office chair at the bench! 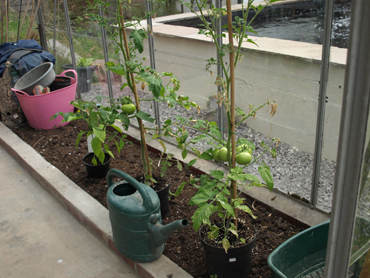 Well, whilst we had a reasonable success with growing during 2013 – we had plenty of tomatoes, peppers and courgettes. 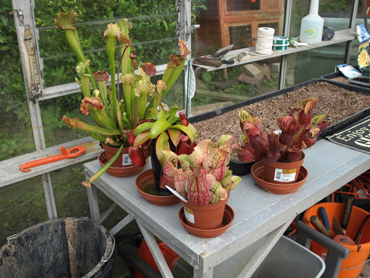 The carnivorous plants were doing well as were some begonias we planted from bulb and some cuttings of a few un-named Hosta which we had found behind the greenhouse. Unfortunately, we let things go over the winter months and lost all but one of the carnivorous plants, so we really need to think seriously about making the greenhouse warmer during the winter and making sure that we still go in there on a daily basis. The begonias have been replanted and are sprouting (right) and some of the un-named Hostas are peeping through again (below). The remaining carnvorous plant has been split into several smaller ones and is doing well – so far! Two small tomato plants have been planted and are growing nicely and a 5ft Strelitzia reginae (Bird of Paradise) is currently residing in the greenhouse. 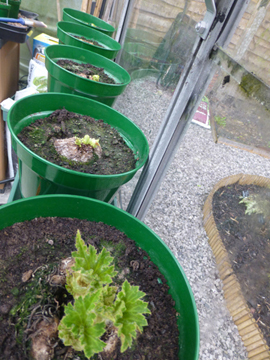 We have planted some courgette and Coleus seeds but, to date, none have germinated. We just seem to be unable to grow anything from seed!